Siestas and Cupcakes: Gosh do I love my..
Quite some time ago now, I used to read like there was no tomorrow, 2, 3 books at a time. All my days off were spent at Borders and I hardly ever left without buying another book. Now I have bookcases and bookcases and stacks and piles of books that I can't seem to get rid of, we've grown attached. My husband thinks books just sit around gathering dust, he doesn't get it. Well, the good man got me a Nook for Christmas! I looooooooooooooooooooooooooooooove it! - The first book I got, because it was only a dollar and change was Where Angels Go by Debbie Macomber. I read this really fast. It was a light hearted feel good read, I enjoyed it. - The second was Sharper Your Knife, The Less You Cry by Kathleen Flinn. If you loved Eat, Pray, Love, as I did, you will love this book too. It's a memoir style book about a woman who is layed off her job and decides to move to Paris and go to Le Cordon Bleu, and all her cooking adventures in school. I hated for this one to end. Bonus--there are recipes at the end of every chapter! -Next was How to Bake a Perfect Life by Barbara O'Neal. Kind of funny to go from the previous one to this one, because it is also food oriented and also includes recipes at the end of every chapter. I really enjoyed this book very much. - Currently reading: House Rules by Jodi Picoult. I'm only on page 52 but already sucked in. - Waiting to be read: Water for Elephants, One Second After, and The Omnivore's Dilemma. And must not buy anymore books until these are finished. The thing is, it's so handy to buy a book! And usually if anyone at all recommends a book, I instantly either write it down to buy or make a mental note and pick it up the next time I'm at the store. 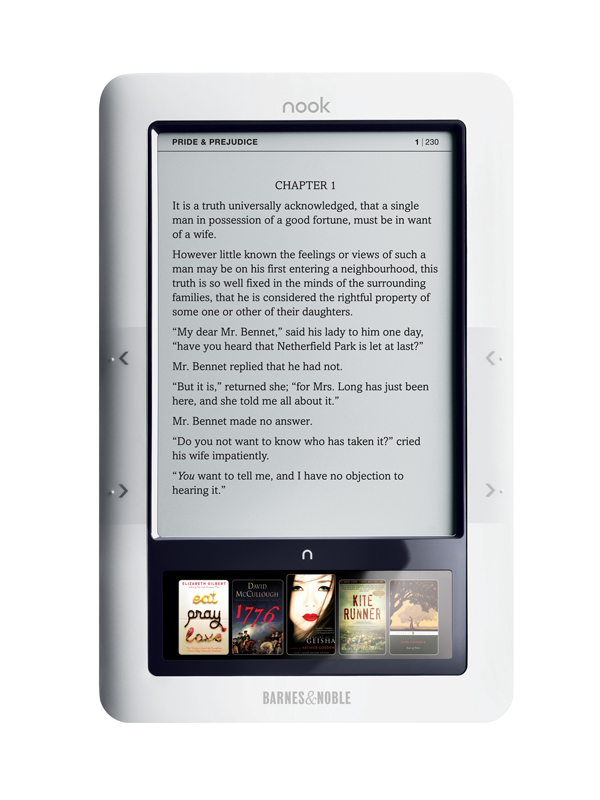 Now with the nook, I just have to hit the shop button, buy, voila! Less than 2 minutes and the book is downloaded right to my very hands. Enough about that, here's what I really want to talk about. I've been rather forgetful the past couple weeks. I started this post with intent on writing about something else entirely and now I've gotten to the point where I was going to do that and now of course can't remember what in the world that was. Sigh. Fabulous post coming soon. As soon as I remember what it was. 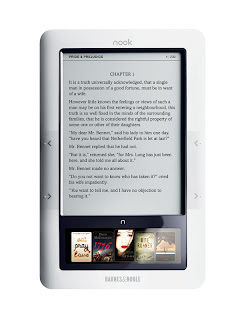 I'm really thinking about getting either a Nook or a Kindle to be more eco-friendly, cause I have SO MANY books!